When was the last time you took your bike on a train? I’m ashamed to say never. I’ve always thought cycle-rail travel was too much hassle. Then I got a commission from the Association of Train Operating Companies (ATOC) to proofread the Cycle-Rail Toolkit 2 for the Rail Delivery Group (RDG). Now I may just try this sustainable form of travel. Admittedly, my previous lack of interest was founded on very outdated information. Back-pedal to 1978, when I was a teenager and Queen frontman Freddie Mercury was all for riding his bicycle where he liked. But you took your life in your hands cycling to the station as there were no cycle lanes, and you could only put your ultra-cool Chopper bike in the guard’s van if they let you. It’s small wonder I never bothered. Cycling through the years to today and the toolkit shows how much easier it is to pedal to stations and take your bike on the train, especially using PlusBike, even if there’s still much to do to improve door-to-door journeys. One of the most surprising facts I learned is the popularity of cycle-train travel. Last year there were 47 million rail journeys that included a bicycle – an increase of 40% since 2010. 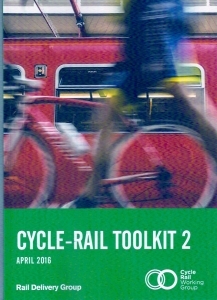 The Cycle-Rail Toolkit may be aimed at those implementing cycle-rail improvements across the rail network, including train operating companies (TOCs), Network Rail and their partners in national and local government, but it’s an interesting read for cyclists and non-cyclists too. It provides examples of best practice in providing facilities for cyclists, encouraging new users and promoting cycling’s benefits. There are numerous case studies about projects that have made cyclists’ lives easier, from cycle hire activities such as Bike and Go across Merseyrail, ScotRail, Northern Rail and Greater Anglia, to smart cards to access secure cycle parking at Brighton and Lewes Stations. As Keith White of Chiltern Railways says in the toolkit’s introduction, the publication “opens your eyes to the bigger picture”. So if you want to ride your bicycle I suggest you read the Cycle-Rail Toolkit and get on your marks, get set, go!